Please donate now to give a voice to all bald eagles nationwide. Also, check out our new Eagle Photo Contest. Since the bald eagle was removed from the Endangered Species list in 2007, it has still suffered great losses through habitat depletion and poisoning by toxic substances. There have also been many uncharged violations of the Bald and Golden Eagle Protection Act (BGEPA). The Protection Act was put in place in 1940 to offer the birds greater protections because of their status as our National Symbol. In April 2015, a nest still frequented by eagles was removed in Virginia Beach for a $30 million commercial and residential development project. In January 2016, a new homeowner, also in Virginia Beach, ordered a tree service to cut down a tree containing an active nest to the horror of onlooking neighbors. No fines or jail time were imposed. In July of 2016, a developer built two large warehouses in Manassas, Virginia, within four feet of an active nest. 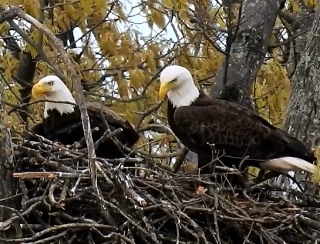 They violated the August 1 start date (end of nesting season) as early as April with soil sampling that forced the two adult eagles to temporarily abandon their eaglets. No permits, buffers, signs, or any protections were allotted to the eagles during the course of the entire construction project. Now they must attempt to successfully breed and raise young with large trucks loading and unloading just twenty feet away. Though bald eagles have had a comeback since the insecticide DDT was banned in 1972, their populations have only grown to about one-tenth of the more than 500,000 birds estimated to have called North America home in the 1700s. They are still seriously threatened by poisoning from lead hunting ammo and fishing sinkers, as well as habitat loss. Because it is our National Bird -- a symbol used on money, on our military emblems, and in many businesses (including our U.S. Postal Service) -- we believe protections must be increased, and enforced, until we have reached a more sustainable and noticeable population. Many Americans have never seen a bald eagle in the wild. This documentary will follow the plight of the Manassas eagles, as well as feature stories from other locations where concerned citizens have stepped up to fight for what's important. It is our Bird. It is our Nation. Check out the Trailer and please Donate to support this important film.